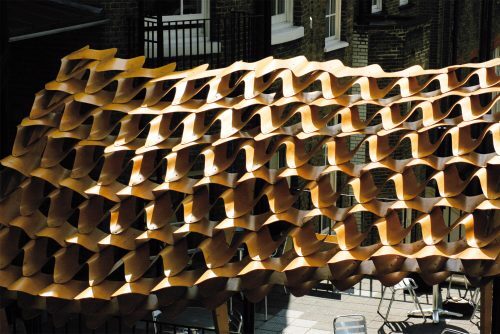 In 2009, the experimental construction project of EmTech programme was located on the upper terrace of AA’s London home, 36 Bedford Square. 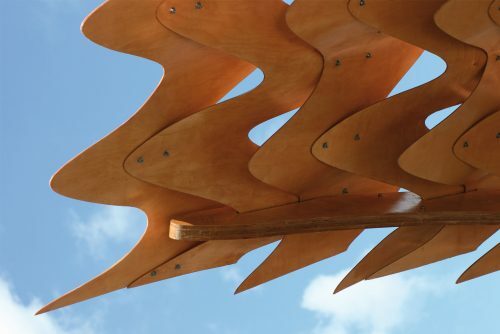 The Wave Canopy has two principal subsidiary systems – wave-like strips of a thin timber composite, and upright timber fins that provide local stiffening to the strips and the connection to the existing steel columns. The fabrication method of the canopy was constrained by the size of the CNC bed and the standard size of timber veneer and plywood panels. Moreover, fabrication by students had to take place within the school, and the assembly was conducted in a very small space with limited access, bringing further constraints on the scale, weight and assembly logic. 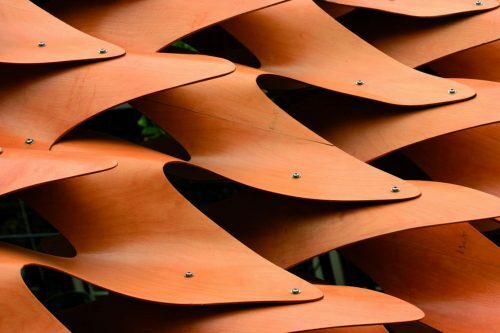 The canopy project brought together two of the principal research paths of EmTech – the mathematics of evolutionary development processes and physical experiments whose geometry is developed in relation to material behaviour. The iterative process of design and fabrication involved advanced computational tools whose input parameters were derived from physical models together with manufacturing and assembly logics. The design of the strips and fins was coevolved concurrently with the assembly sequence to make the best use of the limited space and time available on the upper terrace, as well as to ensure that all the assembly took place safely ‘inboard’ of the balustrade at the edge of the terrace. 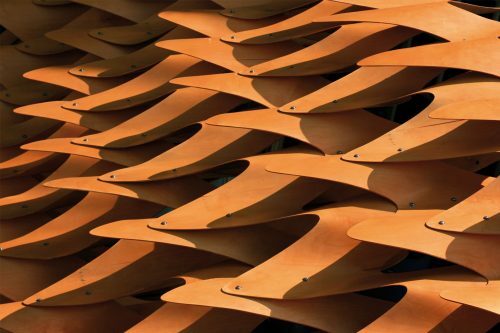 The overlapping wooden wave-like strips were explored and developed in a series of physical models that began with the initial component and concluded with full-size joinery prototypes. Exploratory physical models gave a close but still approximate structural configuration that was refined by digital analysis of deformations under self-weight and wind load. The spatial arrangement and the environmental conditions of the terrace were transformed into data inputs for the optimisation algorithms and computer fluid dynamics (CFD) simulations were used to assess the consequences of each geometric modification on the environmental conditions, and the successive iterations of the associative digital model progressively reduced the turbulence under the canopy, increased the laminar airflows, increased the porosity to prevent the canopy from acting as a sail, and enhanced the structural capacity.